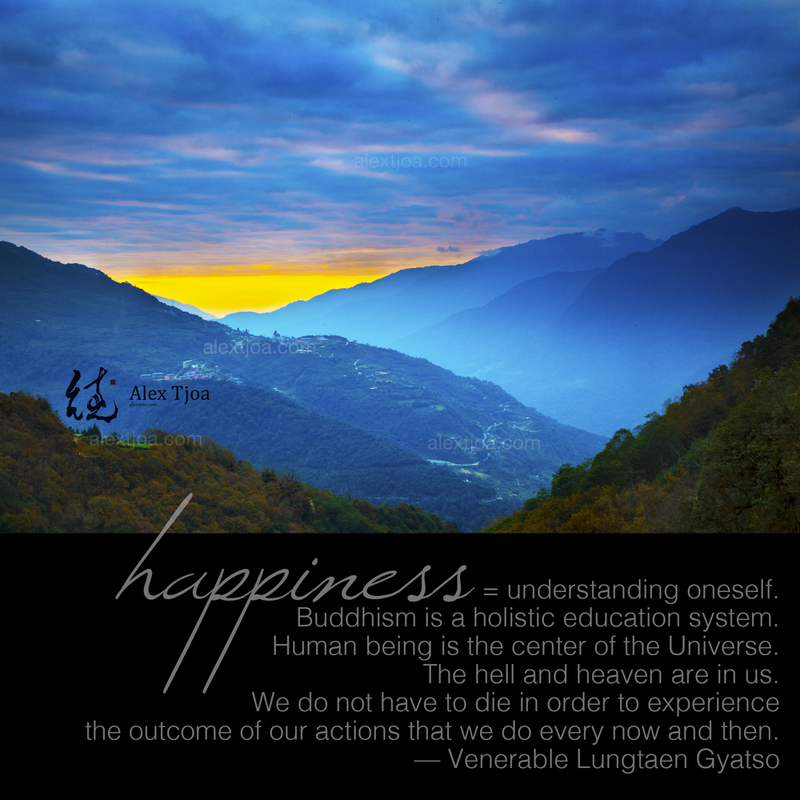 "Happiness = understanding oneself. Buddhism is a holistic education system. Human being is the center of the Universe. The hell and heaven are in us. We do not have to die in order to experience the outcome of our actions that we do every now and then." We are what we pray. Our prayer forms our character. When our prayer is unselfish, we become unselfish and compassionate beings who care for others, nature, flora, and fauna. The prayers are so potent. No wonder Bhutan is so peaceful and full of happiness. To all my Bhutanese friends, you are all the world's guardian of Good! Kaadinchey! - May all beings have happiness and the cause of happiness. - May they be free of suffering and the cause of suffering. - May they never be disassociated from the supreme happiness which is without suffering. - May they remain in the boundless equanimity, free from both attachment to close ones and rejection of others. • One of the Four Immeasurable Qualities is ‘Equanimity‘. In the Tibetan language, it is ‘Tang Nyom‘. Tang Nyom is the practice and aspiration to perceive all beings in the same way rather than with the bias of the labels ‘friend’ or ‘enemy’. Seeing them otherwise is due to a lack of understanding of the true nature of reality. Therefore, it is important to train the mind to perceive all beings with a benevolent attitude and cultivate the authentic quality of Equanimity, or Tang Nyom, towards all beings. "I, me, mine" selfish personal salvation vs. unselfish universal salvation. Our prayer forms our character. "Whatever actions I do—eating, walking, sitting, sleeping, working, and so forth—and whatever I experience in life—up or down, happiness or pain, healthy or sick, harmony or discord, success or failure, wealth or poverty, praise or criticism—whether I am living or dying, or even born in a horrible rebirth; whether I live long or not—may my life be beneficial for all sentient beings. The main purpose of my life is not simply to be rich, respected, famous, healthy, and happy. The meaning of my life is to benefit all sentient beings. Therefore, from now on, may whatever actions I do be beneficial for all beings. May whatever I experience in life—happiness or suffering—be dedicated to actualizing the path to awakening. May whatever I do, say, or think benefit all sentient beings and help them to attain full awakening quickly." And those bound be freed. "I am not attracted to straight angles or to the straight line, hard and inflexible, created by man. I am attracted to free-flowing sensual curves. The curves that I find in the mountains of my country, in the sinuousness of its rivers, in the waves of the ocean, and on the body of the beloved woman. Curves make up the entire universe, the curved universe of Einstein." — Oscar Niemeyer, "The Curves of Time"
"The sword and mind must be united. Technique by itself is insufficient, and spirit alone is not enough." Join my workshops and Facebook page.